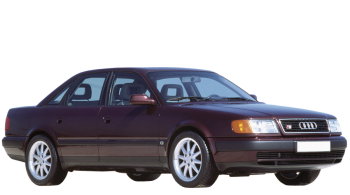 Manufacturing version CS 2.2 Turbo of auto models 100 was launched in 1990 by Audi, and finished in 1991. This auto has 4 doors, the body is in the form a sedan, weight 1.3 tons and length 4.8 meters, which allows a seat 5 people total. «100 CS 2.2 Turbo» is a front wheel drive car with a 3-speed automatic transmission. The 5-cylinders petrol motor with «multipoint injection system» can produce output 165 horsepower at 5500 rmp, which allows you to speed up the car for 9.2 s to 100 km/h and reach ceiling speed of 212 km/h. Medium fuel rate is 10.9 l per 100 kilometers. Fuel tank volume is 80 l of petrol, what allow you to drive approximately 734 km without refueling. The front wheels of this auto have ventilated disks brakes and attached to the undercarriage by dint of suspension type «MacPherson, independent, coil springs» and equipped with stabilizer bar. Rearward wheels have disks brakes and attached to the underframe using suspension type «Unknown, coil springs». Tires have the following dimensions - 205/60VR15. Audi 100 is not tested for Euro NCAP crash test. This car does not have airbags, and there is dynamic systems of safety - ABS.